Can I Trust One Electrical Company for All Electrical Services? Even if you like shopping around and looking for the best deals, it’s always preferable to have all electrical services for your home or building handled by one company. It makes your life much easier. You wouldn’t need to worry about tracking down different providers every time a new issue comes up with your electrical system. However, this convenience comes along with even more importance placed on the company you choose. If your electrical company isn’t reliable, you could be in for a world of headaches with them attempting to handle all your needs. A powerful advantage of getting your electrical services from one company is the ability to save time. If an electrician is called out to check your outlets one day, he might inspect your electrical panel and the other components of your system as well. If another issue arises, this time something related to the panel, he would already be familiar with your system upon his arrival. 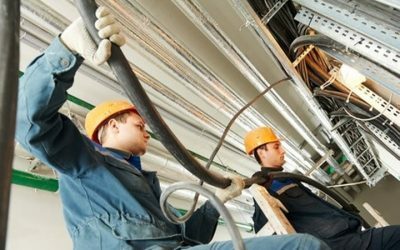 Instead of needing to figure out the various aspects of your electrical setup, he could get right to work. Not all electrical companies are created equal, and some might be a better fit for you than others. When you’re unsure about the reliability of a provider, you might be reluctant to put too much faith in them. On the other hand, the right company can take all the stress out of maintaining and fixing your electrical system, regardless of what might be wrong. ● Inspections to prolong the lifespan of system components and prevent electrical outages. ● Lighting upgrades to improve visibility and safety, while also cutting back on energy costs. ● Audits of your energy consumption to help you reduce your utility bills. ● Component and wiring upgrades that improve reliability and eliminate equipment loss. ● Analysis of issues with up-to-date equipment and knowledgeable staff, to get repairs done quickly and efficiently. ● Corrections to electrical code violations. ● Installations of backup generators, solar energy systems, lightning protection, new outlets, updated panels and other components. This is just a small sampling of all electrical services we can provide for your business or residence. For more information on the ways you can benefit from having a single company provide you with all electrical services, give us a call today at (770) 680-2144. At Bryan Electric, we’re always happy to answer any questions you might have. Get in touch with us. We can make the headaches associated with all electrical services a thing of the past.